Being national is the condition of our times, yet never before has the idea of the nation been under such scrutiny. With the collapse of the bi-polar world of the Cold War, there has also been a parallel rise in the subnational--the claims of local, regional, and ethnic minorities--economic globalization, American cultural hegemony, international migration, and diasporization. 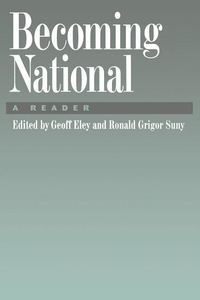 In Becoming National Eley and Suny, two of the foremost authorities on nationalism, acknowledge these changes by combinging a diverse selection of readings with a unifying introduction and instructive headnotes, creating a text that moves the discussion of nationalism onto a new and contemporary level. Each group of readings is introduced by a brief historical essay, and the readings are fully annotated. Emphasizing the recent intellectual advances and influential ideas of Miroslav Hroch, Benedict Anderson, Paul Gilroy, Stuart Hall, Lauren Berlant, and a host of others, this book underscores the nineteenth and twentieth century nationalist theories to show not only where scholars of nationalism have been but where they are going. Drawing on the strengths of recent cultural studies, including race and gender identities, the editors show that though politics is the ground upon which nationalism is constructed, culture is the terrain on which it is elaborated and fought over.